Politics is hard. Making policy that appeals to a wide range of political actors, stakeholders, and related interests, is by some people’s estimation functionally impossible. But at the heart of every legitimate political endeavor, there is the core insight that in its most expansive sense, what is of real interest to humanity anywhere is of real interest to humanity everywhere. We are connected by certain shared truths. We require certain sustenance to facilitate our survival, and we are all vulnerable to the forces of nature and of human violence. 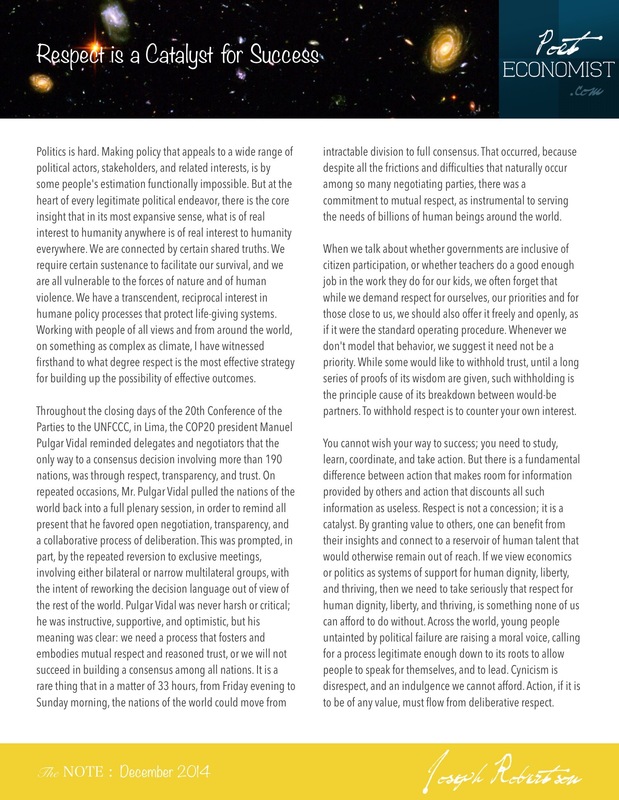 We have a transcendent, reciprocal interest in humane policy processes that protect life-giving systems. Working with people of all views and from around the world, on something as complex as climate, I have witnessed firsthand to what degree respect is the most effective strategy for building up the possibility of effective outcomes. Throughout the closing days of the 20th Conference of the Parties to the UNFCCC, in Lima, the COP20 president Manuel Pulgar Vidal reminded delegates and negotiators that the only way to a consensus decision involving more than 190 nations, was through respect, transparency, and trust. On repeated occasions, Mr. Pulgar Vidal pulled the nations of the world back into a full plenary session, in order to remind all present that he favored open negotiation, transparency, and a collaborative process of deliberation. This was prompted, in part, by the repeated reversion to exclusive meetings, involving either bilateral or narrow multilateral groups, with the intent of reworking the decision language out of view of the rest of the world. Pulgar Vidal was never harsh or critical; he was instructive, supportive, and optimistic, but his meaning was clear: we need a process that fosters and embodies mutual respect and reasoned trust, or we will not succeed in building a consensus among all nations. It is a rare thing that in a matter of 33 hours, from Friday evening to Sunday morning, the nations of the world could move from intractable division to full consensus. That occurred, because despite all the frictions and difficulties that naturally occur among so many negotiating parties, there was a commitment to mutual respect, as instrumental to serving the needs of billions of human beings around the world. When we talk about whether governments are inclusive of citizen participation, or whether teachers do a good enough job in the work they do for our kids, we often forget that while we demand respect for ourselves, our priorities and for those close to us, we should also offer it freely and openly, as if it were the standard operating procedure. Whenever we don’t model that behavior, we suggest it need not be a priority. While some would like to withhold trust, until a long series of proofs of its wisdom are given, such withholding is the principle cause of its breakdown between would-be partners. To withhold respect is to counter your own interest. You cannot wish your way to success; you need to study, learn, coordinate, and take action. But there is a fundamental difference between action that makes room for information provided by others and action that discounts all such information as useless. Respect is not a concession; it is a catalyst. By granting value to others, one can benefit from their insights and connect to a reservoir of human talent that would otherwise remain out of reach. If we view economics or politics as systems of support for human dignity, liberty, and thriving, then we need to take seriously that respect for human dignity, liberty, and thriving, is something none of us can afford to do without. Across the world, young people untainted by political failure are raising a moral voice, calling for a process legitimate enough down to its roots to allow people to speak for themselves, and to lead. Cynicism is disrespect, and an indulgence we cannot afford. Action, if it is to be of any value, must flow from deliberative respect. Joseph is Global Strategy Director for the non-partisan non-profit Citizens' Climate Lobby. He is the lead strategist supporting the Acceleration Dialogues (diplomatic climate-solutions roundtables) and Resilience Intel—an effort to move the world to 100% climate-smart finance. Joseph represents CCL in the Carbon Pricing Leadership Coalition, the UNFCCC negotiations, and other UN processes, and is founder of the Geoversiv Foundation and Live Your Democracy—an online periodical promoting engaged, non-partisan civics. His articles appear from time to time in the Guardian.